Have you been to Jesus for the cleansing power? We have to go to Jesus for cleansing from our sin, and nowhere else. He told us that, saying, “I am the way, the truth, and the life: no man cometh unto the Father, but by me.” The Apostle Paul taught us, “Neither is there salvation in any other: for there is none other name under heaven given among men, whereby we must be saved.” Friends, there is no other way to be washed of our sins besides the Lord Jesus Christ….none. Sin you say? What sin? What am I guilty of? Well, “all have sinned” and come short of the glory of God“, and “there is none righteous, no not one.” In the eyes of a perfect and Holy God, we are all unclean and in need of cleansing, and Jesus is the ONLY way. Are you fully trusting in His grace this hour? To be cleansed, we have to trust only, only, only in the completed work of Jesus Christ, “ For by grace are ye saved through faith;” We cannot work for, nor contribute to our own salvation, because “all our righteousnesses are as filthy rags;” in the eyes of a perfect and holy God. Friends if we are working and trusting in anything besides His grace, we remain doomed. When the Bridegroom cometh will your robes be white? Will your soul be ready for the mansions bright? One way or another we will all meet Jesus. We may meet him upon His return, or we may meet Him upon our own death. At some point, we will all meet Him because “it is appointed unto men once to die, but after this the judgment.” We will meet Him as either savior or judge, for “every knee should bow” and “every tongue should confess that Jesus Christ is Lord.” Friends, He is Lord of your life no matter what you have done with Him. That is an invitation, my friends. Are you still stained by the weight and guilt of sin? Do you understand that you are and that you exist separated from a just and Holy God? Lay aside those garments, agree with God regarding your sin, and ask him to save you. Ephesians 2:8-9 For by grace are ye saved through faith; and that not of yourselves: it is the gift of God:Not of works, lest any man should boast. 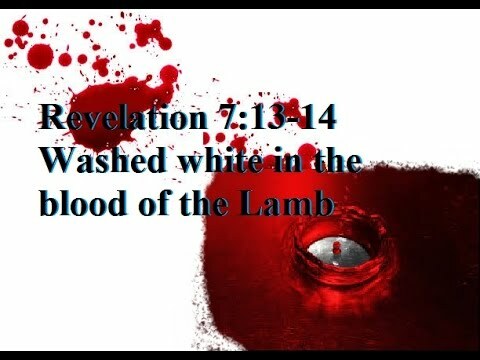 This entry was posted in Are You Washed in the Blood of the Lamb?, Daily Devotion and tagged Are You Washed in the Blood of the Lamb?, Born Again, faith, Jesus. Bookmark the permalink.